The Ballad of Buster Scruggs is a ponderous thing, too. But it’s more silly than anything, at least at the onset, as the first vignette is so ridiculous (where the titular Buster Scruggs, played by Tim Blake Nelson, merrily goes on a singing and killing spree) I almost turned away from the rest. The second vignette wasn’t much better and equally absurd, though at least we get to watch James Franco get hung…twice. One wonders why they chose to show the weakest vignettes first, but patient viewers will be rewarded with the gold in the middle. The third vignette about a traveling armless, legless thespian plays like David Lynch lite, and it’s weird more than anything, but also dreadfully sad. The fourth vignette, where Tom Waits is a gold prospector who happens upon the most verdant of valleys (both in terms of natural scenery and gold ore) is a tight, perfect little thing. 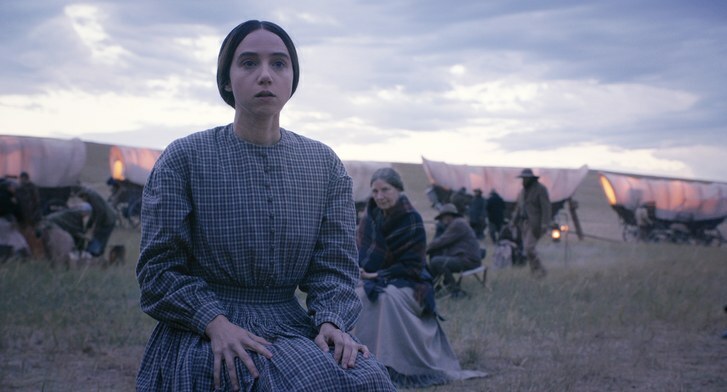 The fifth vignette, with Zoe Kazan on the Oregon Trail, plays like a Disney-fied take on Kelly Reichert’s grim Meek’s Cutoff, and it works splendidly as a mini-movie, complete with full character arcs, suspense, and pathos. The sixth and final vignette features a bunch of old people singing and talking in a stagecoach, musing on the art of storytelling, which (in addition to being about the Old West), The Ballad of Buster Scruggs is all about. It’s a throw-away vignette, but there it is, proud and ponderous and little bit blustery. But as the gold ores in the middle of this film show, the Coens are still at their best when they abandon talking about storytelling and just straight-up tell a good story. All along the way the vignettes are prefaced with the pages turning of a book of Western fables and beautiful color plates. It makes one wonder…in this day and age of streaming entertainment and the lines between TV, film, and streaming increasingly blurring, are the adaptations of short stories ripe for the picking? Imagine if Netflix produced an anthology series featuring acclaimed veteran film directors adapting classic short stories. We could have Patty Jenkins filming Flannery O’Connor’s A Good Man is Hard to Find…or Christopher Nolan filming Shirley Jackson’s The Lottery. Now that could be really something…but for now we’ll have to settle for the beautifully rendered but stale western archetypes of The Ballad of Buster Scruggs. This entry was posted in Movie Reviews, Movies and tagged Fables, James Franco, Netflix, Storytelling, The Ballad of Buster Scruggs, The Coen Brothers, The Old West, Tim Blake Nelson, Tom Waits, Vignettes, Westerns, Zoe Kazan. I think the genius and essence of the Coen Brothers art is portraying archetypes in a humane light by putting them in outrageous and sympathetic situations, so that we are able to see ourselves, albeit through an absurd lens. Sometimes that formula is wonderfully successful, sometimes it falls a little short of it’s grand intentions and sometimes it’s just plain weird. Wonderfully put. This film was all three of those results! Truly a mixed bag. The Zoe Kazan piece made the entire film worth seeing as did the hanging of James Franco. The first two vignettes almost made me give up it, but I’m glad I persevered.